When it comes to my 1970s childhood, some things can still justify my fond memories and some things I am eager to experience because I missed them the first time. “The Rockford Files“ is a bit of both. I remember watching it when it aired originally, but I don’t remember specifics. It’s also been a hard show to track in syndication. It was on A&E regularly about ten years ago, and I tried unsuccessfully to make a habit out of it. Thank goodness for Netflix, then, to help me catch up now. I just finished the first disc, which has the first three regular-series episodes (and not, apparently, the 90-minute TV-movie pilot — rights issues, I’m sure), but even at this early point I find the show tremendously endearing. Most of this is due to James Garner’s charm. While private eye Jim Rockford is world-weary and pragmatic, he takes life in stride and with a good deal of humor — even suffering frequent beatings from a steady stream of goon squads. Having served prison time for a crime he didn’t commit, Rockford is cautious and keeps an eye out for himself, but this doesn’t stop him from being good-hearted. Everything seemed to come together well in this show. Co-creator Stephen J. Cannell went on to be an extremely prolific producer, creating “The Greatest American Hero,” “The A-Team,” “Hunter,” and “Wiseguy,” among many others. I’m much more familiar with them, but so far “The Rockford Files” has a verve which seems to say that all those later efforts came just short of recapturing this show’s special appeal. It’s not really “quirky” in a self-conscious “Northern Exposure” or “Monk” kind of way (and I liked both of those, don’t get me wrong) — it’s just affable and laid-back. If it were a cowboy it would mosey. I was only in Rockford country briefly, if at all, driving up the Pacific Coast Highway in the summer of 2000 during the week between the San Diego Comic-Con and a poverty-law conference in Berkeley. I don’t know whether my affection for “The Rockford Files” comes from nostalgia for those bucolic few days in the country, or whether I enjoyed the drive out of subconscious memories from an old TV show. Regardless, while I’m not sure I’m ready to live in 2006 California, Rockford’s California of 1974 remains eternal. Call me an old softie, but Infinite Crisis #4 was one of the more emotionally affecting comics I have read in recent months. At the very least, Geoff Johns, Phil Jiminez, and George Pérez know which middle-aged fanboy buttons to push. First off, dropping Chemo on Blüdhaven? Genius. Next, the Nightwing/Batman scenes really captured both how I view the characters and how their fictional peers view them. Given what he’s been through during the Devin Grayson run, is it ironic that they still trust Nightwing? The big fight with Superboy-Prime was chilling, with a bit of gratuitous violence (oh sure, rip apart the Titans nobody likes), but his reaction to it was almost heartbreaking. Remember, this was the kid from “our” Earth, where the only superheroes were fictional – but by the same token, this kid grew up with the perfect fictional ideal of Superman. Not just the Superman of Julius Schwartz, but of “Super Friends,” George Reeves, and Christopher Reeve (and before Superman IV, too!). Imagine a young “Clark Kent,” who grows up looking like his namesake, and upon discovering he can fly, almost literally runs into the real thing (or at least one of them). Talk about a reader-identification character! Naturally, by the time of Infinite Crisis, he’s been isolated for who-knows-how-long and fed a constant diet of good ol’ days reminiscing mixed with growing frustration. Sure he’s come unhinged; but Johns, Jiminez, and Pérez made me feel for him. Never mind whether he represents some segment of the DC audience whose mind has been warped by the unrealistic expectations of the older fans – from the beginning he’s been in over his head, and in hindsight it’s a wonder he lasted this long. What’s more, he’s not done yet, if his new DC Direct action figure is any indication. Still, the sequence that haunted me in this morning’s wee hours was the Pérez-drawn “deaths” of the Flash and Kid Flash, with special appearances by DC’s honored dead speedsters. Obviously I don’t believe there’s anything permanent about the fates of Wally or Bart, and I would be very surprised if there were. Nevertheless, when Jay Garrick said the Speed Force was gone, it told me that DC was serious about putting its speedsters out of action at least until the summer. Oh, and Detective Allen becoming the Spectre? Who had this issue in the pool? Time will tell whether Infinite Crisis #4 was the start of an epic struggle that truly rivaled its predecessor, or just a collection of emotionally manipulative scenes. If it’s the latter, for me the manipulation was skillfully done. As The New Teen Titans #21 (July 1982) opens, Raven and Starfire race to stop a bomb from exploding at a baseball game. (Hard to say which team — the players wear Yankee pinstripes with Met-colored caps, and have players named “Mack” and “Stern” who must have been MLBers on Earth-1 only.) That takes five pages, during which I noticed that Romeo Tanghal’s inks have gotten tighter. Anyway, the terrorists are only there to test the Titans, so that takes care of the immediate suspense. However, their mysterious employer isn’t Brother Blood, as one might have expected, but some guy in a satellite. I’m sure Marv forgot about him. The actual plot begins outside Buzzard’s Bay (our fair city) MA, with former Vic Stone girlfriend Marcy Reynolds running for her life from a red-and-black robed Gun-Totin’ Nun. I have to say, this page looks cool, but makes no sense, and both Wolfman and Perez are to blame. Basically, GTN wings Marcy with a laserbeam, and it looks like Marcy’s stuck on the railroad tracks, but really GTN is the one on the tracks, completely oblivious to the train as it runs her down. Neither Marv nor George thought GTN would notice, what with the bright headlights and the CHUGCHUGCHUGs? Crikey. Anyway, as Cyborg is finally unburdening himself to Sarah Simms (she just wants to be friends), Marcy calls to tell him she’s on the run from “Brother Blood” and (SKRA-BLAM) AGGHHH! Vic leaps across town to the rescue, but too late. Perez makes up for the train scene with the next page’s sequence of Vic mourning. Back in Massachusetts, Sister Karyn gets fed to the Ranc– that is, to the giant mutated spider, for failing to vet “Sister Marcy” fully with regard to her former boyfriends. At this point we get the big reveal of Brother Blood, a caped-and-masked supervillain type flanked by a blonde henchwoman with Farrah hair (another example of ’70s turtlenecked horror, I think). Blood wears what I always think looks like a giant ant skull on his head, and below that a full-head mask that only exposes his ears, mouth, and chin. Even for a cult leader, he looks creepy. Even for a cult leader in the spandex-filled DC universe, he looks creepy. As we will learn, however, he covets mainstream legitimacy, and I’m sorry — maybe I just don’t get how acceptable the creepy supervillain suit is supposed to be. (Like black clothes and Nikes, maybe?) If I had to pledge my life to Jim Jones, David Koresh, or this guy, I’d take bad hair and weird glasses over ant skulls. Did I mention he sits in an animal-skull-shaped throne? Vic asks the Titans to investigate Blood. Starfire wonders angrily, “Is this the way things are on your world? You fall in love and your lover has to die?” With the help of Marcy’s dad, the Titans get some background info on Blood, and the infiltration is afoot. Robin, Raven, Wonder Girl, and Kid Flash (i.e., the Titans without exotic features) get trucked into Blood’s castle, which has the same kind of neogothiclassical architecture as Azarath, except colored darker. The Titans soon learn that Blood’s been alive for over 700 years and his home base was the Baltic island of Zandia. Small world. Blood’s scanners blow the Titans’ cover, picking up “biological anomalies” in everybody but Robin. Meanwhile, Wally laments that “[s]omething twisted like this thrives while real religions are in trouble.” Over in the girls’ dorm, Raven finds her first experience wearing pants uncomfortable, but not as much as the fight-the-power portrait of Blood. At the deliberately unpleasant prayer meeting, Blood dishes out punishments for the repentant and the unbelievers. After Blood roasts a mouthy convert with an energy blast from his forearm, Raven feels her pain, and is exposed. Blood commands the congregation to attack the Titans. In the melee that follows, each Titan falls one-by-one to Blood. However, Raven’s soul-self escapes. On to NTT #22 (August 1982), where Blood has his Mother Superior, “Mother Mayhem,” throw the three powered Titans in the spider pit. Blood then gets a videophone call from a Senator who’s having trouble drumming up the palm-greasing cash necessary to have Congress recognize Zandia as a nation and the Church of Blood as a religion. (The Senator mentions ABSCAM; insert Jack Abramoff joke here.) Blood says that after the recent coup in Zandia, the new president will be more democracy-friendly, but he’ll work on some good PR anyway. At Titans’ Tower, Cyborg is lashing out at the exercise equipment, eager to go after Blood. Starfire’s also ready for action, but Changeling tries to hold them both back. Although Raven’s soul-self appears at that point, Cyborg is still keyed-up, and the scene closes oddly, with Vic’s hand around Gar’s throat. The Confessor still can’t get Robin to crack, so Blood decides to throw him in the pit with the others. They’re all unconscious, so Robin has to fend off the giant spider by himself. He keeps his cool, evades the spider, and tries to use Wonder Girl’s lasso to lift his teammates to safety. As the T-Jet streaks towards Massachusetts, Blood has arranged for his personal journalist, Bethany Snow, to put a happy face on the Church of Blood. “My name should no more frighten people than my traditional ceremonial garb,” Blood muses, and … yeah. Blood says that people fear his church for “no reason,” and even now the church fears a superhero attack. On cue, Starfire, Cyborg, and Changeling start tearing the place apart. Let’s pause here and note that Bethany Snow may be one of George Perez’s most underappreciated characters. She has a certain just-past-her-prime look, with a well-coiffed hairdo and slightly matronly clothes. Her face is filling out and she has a bit of a double chin, which comes out in these scenes when she’s caught terrified in the middle of a super-fight. You know she’s playing a part, but she’s drawn so well you still sincerely loathe her. Ah, Bethany — as we will see, you were truly ahead of your time. While Cyborg confronts Blood, Robin has secured Wonder Girl high above the spider. Unable to save the unconscious Raven from the looming spider, he voices a last lament to Bruce Wayne before Raven’s soul-self zaps the beast and reunites with her body. As she teleports out, she delivers the unfortunate line, “Try to arouse Wallace while I open the pit door.” Just wait a few years, Raven, and Wallace will be plenty aroused. Bada bing! Somehow Blood’s gotten away from Cyborg, and somehow Raven knows where, because she teleports right to him. However, Blood steps right through her soul-self. Cyborg bursts through the wall, only to be downed by Blood. Raven, still reeling from psychic feedback, opens up the Rancor pit, allowing Kid Flash, Robin, and Wonder Girl to come up. Starfire zaps Blood, and Kid Flash and Wonder Girl punch him, but he still manages to get away. Cyborg catches up to Blood as he takes off in a futuristic plane. Cyborg leaps onto the plane and pulls off one of its tail fins. The plane crashes, apparently killing Blood, but Raven says Blood was never aboard. Indeed, Blood watches Bethany on TV intone “You’ve seen the facts — you decide what is the truth.” I’m not making this stuff up, folks. There’s a lot of goofiness in the first Brother Blood story, but in many ways it’s the start of a great run by Wolfman and Perez. This story laid the groundwork for many others, both in the immediate future and years down the road. The Blood/Zandia connection was played up, as was Blood’s ability to ignore Raven’s soul-self. Bethany Snow also returned to bedevil the Titans. In short, this essay will get a workout as we go further into the series. As if all that weren’t enough, the last two pages of #22 led directly into the long-promised Blackfire story, which in turn ushered in the Titans’ third — and perhaps most consistently compelling — year. I found a couple of those DC Comics Presents issues. DC Comics Presents #28 (December 1980) was written by Len Wein, drawn by Jim Starlin and Romeo Tanghal, and edited by Julius Schwartz. 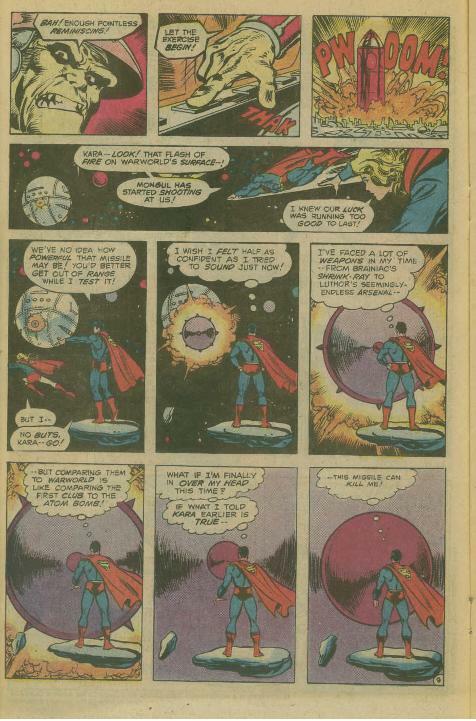 It opens with Superman and Supergirl on the trail of Mongul and his Death Star knockoff “Warworld.” Say, wouldn’t last issue’s guest star, J’Onn J’Onzz, have been good to bring along? Well, Supergirl’s helpful exposition tells us that in order to get Warworld’s Crystal Key, Mongul kidnapped Lois Lane, Jimmy Olsen, and Steve Lombard to force Superman into fighting J’Onn for it. (Steve was the office jackhole, but I guess two out of three was good enough for Supes.) The implication is that the fight took so much out of Supes and J’Onn that although J’Onn took the worst of it, Supes still had to call in Supergirl. Like I said before, I didn’t buy much DC Presents as a youngster. I’m confident I bought this one because I wanted to see what could have been so important that it needed Supergirl’s help. I was not disappointed. This issue revels in that very notion, making Warworld bigger, badder, and meaner than just about anything either Super-cousin had yet encountered. What’s more, it does so almost playfully, using variations on the same trick of perspective to convey the enormity of Warworld’s various dangers. Smiley-face aside, the bigness of Warworld earns our heroes’ respect. Naturally, its sensors pick them up, and after Mongul recalls the events that led to his ouster, scratches his itchy trigger finger. This next page really captures the flavor of the issue. Not only is it another exercise in perspective, it has Superman shooing Supergirl away so he can “test” the potency of a mountain-sized missile. Superman’s already given Supergirl a warning about the limits of invulnerability, and once again he takes the big-brother role. To him it makes perfect sense, because although they are pretty equal in power and ability, he’s more experienced, she’s too impulsive, etc. It almost make Superman look condescending. However, it does set up the last panel…. This page ends with a variation on the same gag, but it hasn’t gotten old yet. 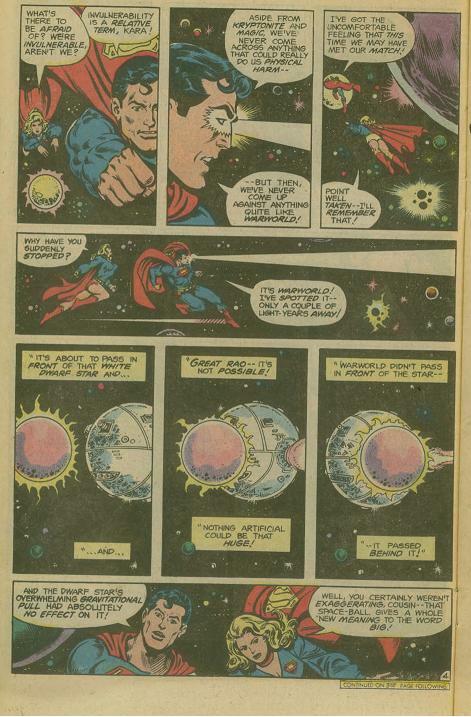 Again, it reinforces the point that the Kryptonians can’t match Warworld for straight-ahead brute force, so Supes decides to employ some “strategery.” The cousins make Warworld work overtime to try and kill them, which ends up overloading the cybernetic controls plugged into Mongul’s brain, and Mongul keels over. Given that Supes got the idea from the mountain of graves next to the control center, this seems a bit outside his usual ethics. 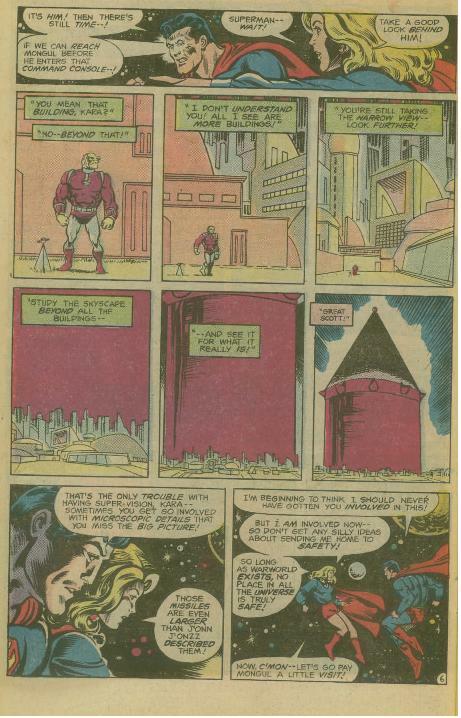 Still, Supergirl’s telescopic vision confirms that Mongul is just unconscious, and also an organ donor. Unfortunately, Mongul’s incapacitation has the opposite effect — Warworld goes off on automatic. Change in plans: while Superman distracts it, Supergirl aims to punch a hole through it by moving faster than its sensors can follow. There’s nothing technically adept about this next page, but I couldn’t resist another shot of the deadliest smile in the galaxy. Supergirl’s feat allows Superman to fly into Warworld’s computer core and reprogram it for self-destruct. Mysteriously, Mongul’s not around to slow Superman down as he escapes. Warworld blows up, but now there’s a new problem — where’s Supergirl? 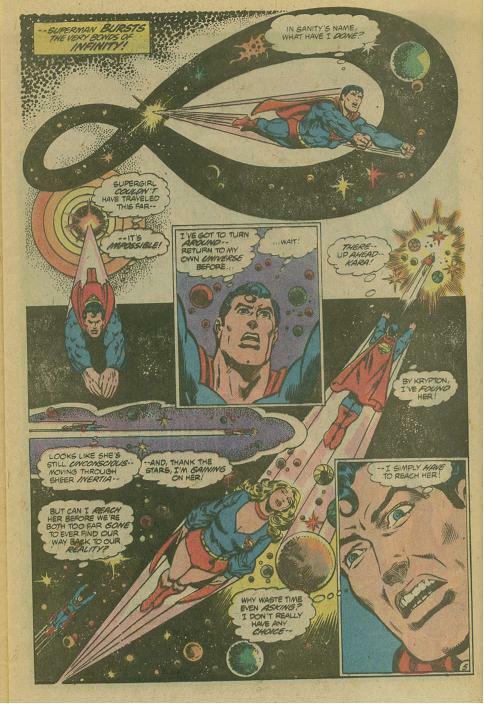 … he “bursts the very bonds of infinity!” This snaps him back to reality (so to speak), but before he can try to get back to his “own universe,” there’s Supergirl, up ahead. On he goes, but not too far, before he literally runs into the Spectre. 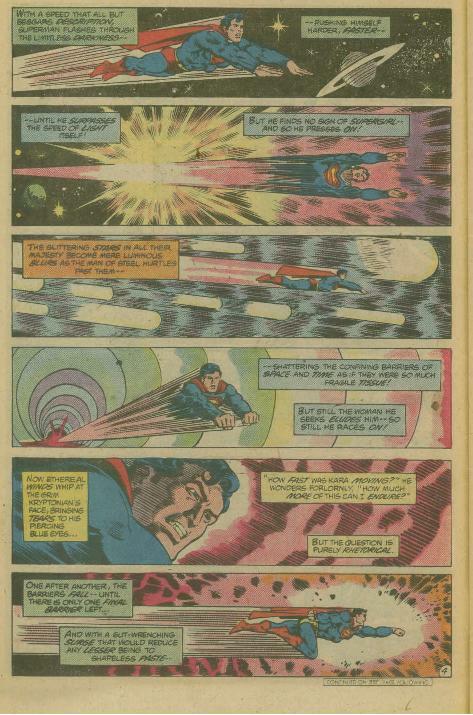 Spectre shows Superman Jor-El’s futile attempts to save Krypton, which Superman imitates with similar results. 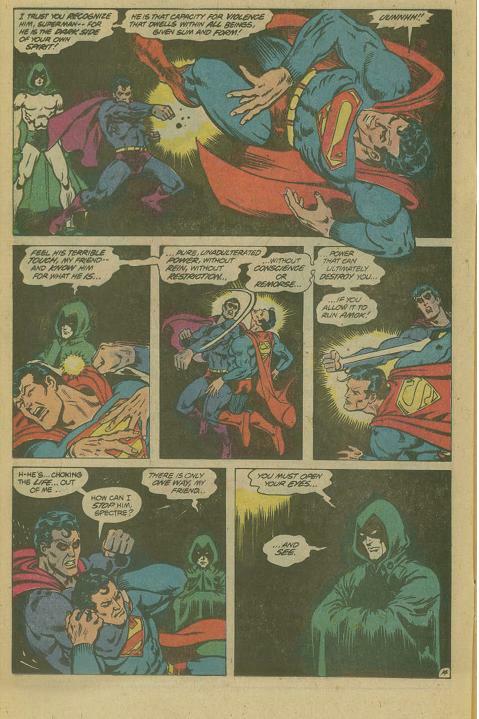 Spectre then shows Superman literally unable to save Jonathan Kent from the Grim Reaper. Finally, three years before Superman III, Spectre has Superman’s dark side attack him. Dark Supes is “pure, unadulterated power, without rein, without restriction … without conscience or remorse … power that can ultimately destroy you … if you allow it to run amok!” What to do? Superman’s sarcastic observation turns into a moment of reflection which allows him to see that he’s been thinking with his heart, not his head. The Spectre’s boss also makes an appearance, more or less, blessing Supes’ newfound clarity. Still, why did Spectre stop Supes from catching Supergirl? 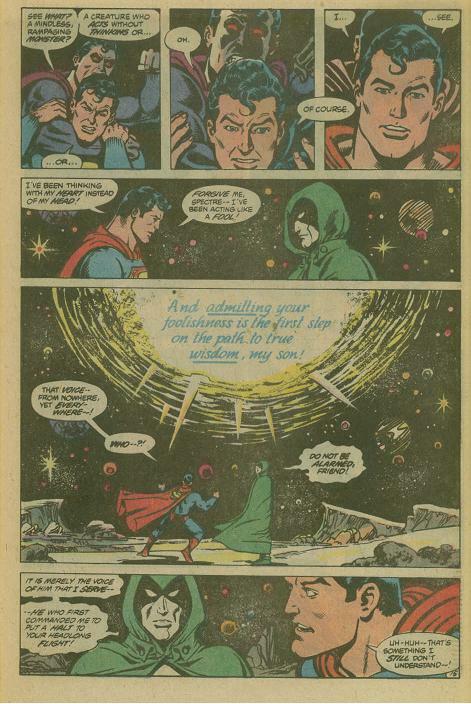 The answer is that Superman was “traveling far faster than [he] ever had before … shattering barrier after barrier until only one remained … that golden veil beyond which no living man may trespass!” Somehow, according to the Spectre, that “risked the ultimate destruction of civilizations beyond numbering!” Either that means Superman was going to kill himself — thereby depriving said civilizations of a protector — or by breaking the “heaven barrier” he would have released some ultra-powerful cosmic energy. In other words, don’t cross the streams. Anyway, Supergirl turns up fine, Superman has learned a valuable lesson, and everyone goes away happy. The End. Now, clearly this is not the most serious examination of the implications of the Earth-1 Superman’s power, but I like these issues because they go from reverence to irreverence and back again. The Warworld attacks in #28 manage to be both suspenseful and over-the-top, and the amount of power being thrown around there sets up the deeper discussion of #29. I’m sure there have been other Superman stories questioning why he can’t be everywhere and save everybody, but this one handled the question briefly and well. You say there’s nothing too powerful for Superman, let alone Supes and Supergirl? Wein and Starlin cheerfully present Warworld. Well, what about the potential abuse of that power? Wein and Starlin use the Spectre to remind Superman that vast though it may be, there are limits, self-imposed and otherwise, on his power. 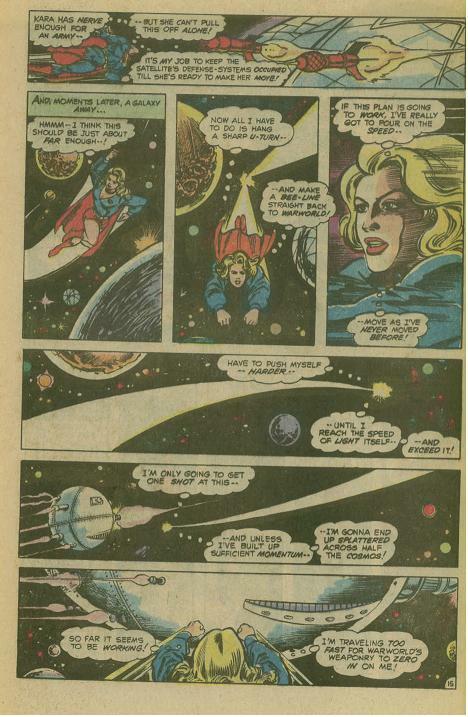 In hindsight, of course, these issues help reinforce the impact of Supergirl’s death in Crisis on Infinite Earths. They show the Kryptonian cousins in their prime, and especially present Supergirl as a happy warrior, more eager and exuberant than Superman. 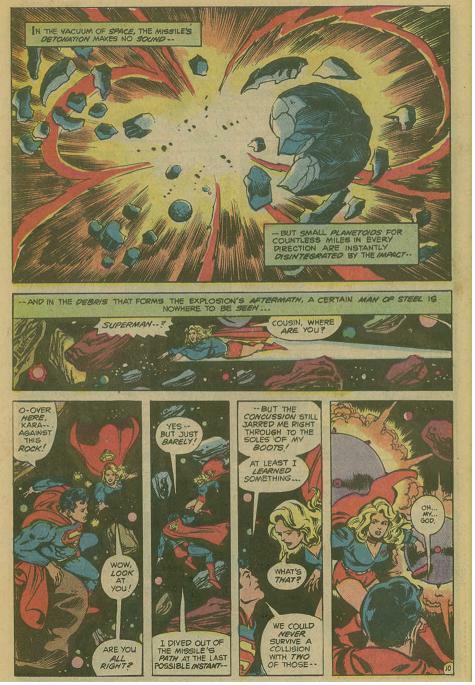 It’s easy to see the Supergirl of DCCP #28 charging at the Anti-Monitor, which makes it all the sadder to see the Superman of COIE unable to bring her back one last time. One only hopes that in his mourning, he remembered the lessons the Spectre taught him just a few years before. Sorry about not posting over the weekend, despite Ragnell’s best efforts. Instead, the Best Wife Ever and I spent Saturday and Sunday on household chores and errands. We are steadily getting organized, even if it’s taking a while. So I started this last night, but went to bed early with a nagging headache. Last week I finished watching Return of the Jedi, which wraps up my several-weeks-long attempt to view all six Star Wars films in episodic order. As a standalone movie Jedi has its flaws, but as the last part of the cycle it’s not bad. Apart from that scene, though, one of Jedi‘s big faults is its failure to use Han and Leia to their fullest. The movie seems to consider the issue of their relationship settled once she unfreezes him, except for a bit at the briefing where she acts surprised that he’s staying with the Rebels. (If he were going to leave, wouldn’t he have split before then? Jabba wasn’t getting any deader.) The rest of the time everyone’s doing something loud and/or fast, and there’s not much opportunity for witty banter in the style of previous episodes. Again, the point of the movie is to show Luke’s triumph and the defeat of the Empire — in other words, big fight sequences. Those Jedi does well, even with the despised Ewoks. (Lucas’ DVD commentary opines that the Ewoks were cannon fodder until the Rebels could gain the upper hand, and let’s not forget that Chewie in a scout walker played a big role too.) The tripartite Battle of Endor makes an appropriate bookend for the four-front Battle of Naboo (even if it’s really vice versa), but what’s interesting to me is the type of special effects employed. Jedi accomplishes pretty much the same spectacle as Phantom Menace without using any computer graphics. Obviously, after Episode III, the amount of computer-generated imagery dwindles. It could even be that the additions to the original Star Wars help ease the transition from CGI-heavy prequels to the original vintage effects. With relatively few CGI additions in Jedi, and none that stand out from the beginning of the Sail Barge sequence to the end of the Death Star, I felt “weaned off” CGI before the big battles started. One of those concluding additions, of course, is the replacement of armor-less Anakin with a somewhat sheepish Hayden Christensen. I respect the opinions of others, but I liked it. Not only did it supply another link between trilogies, it allowed Luke to see his father in his prime, not as the Jedi he might have grown into. Lucas has suggested that Anakin looks like Hayden now because that’s how he looked when he “died in the good side,” or some such. I’ll accept that, but I’d also like to think Luke sees his own idealized version of Anakin — a young Jedi, around his own age, wearing robes more reminiscent of Obi-Wan than of Vader. Ironically, one of the more unfortunate comparisons between Jedi and Episode III is that both movies find Vader utterly defeated after the big saber duels. Vader may get the worst of it in Jedi, since all it seems to take is one last, furious burst from Luke to catch him off guard. Most other times I’ve watched that scene, I’ve focused on Luke finally tapping into the dark side to defeat Vader. That’s clearly where the emphasis is supposed to be, but with the prequels fresh in mind I suppose the emphasis shifted. Nevertheless, the parallels are still there. At the end of Episode III, Palpatine rescues Vader and puts him in the suit. At the end of Jedi, Vader kills Palpatine and Luke helps him unmask. It’s a neat way to balance everything out, and it illustrates how the cycle manages to hold together almost in spite of itself. Last night’s post sounded a little cranky to me, so sorry for that. I do enjoy maintaining this blog, and if I were to become an everyday blogger, that wouldn’t be so bad. If I get the chance, I will look for that Sandman letter column, to see if it’s worth keeping. And yes, this post keeps the “everyday” streak alive. No promises for the weekend, though. For a while I have struggled with replacing certain series with trade paperbacks. I have the first two trades each of Sandman and Starman (1994), and from there started getting each on a monthly basis. Each ran about 80 issues, including annuals, specials, and Secret Files, so going to trades would free up a lot of space, and it would probably result in me reading them more often. However, Starman also had an occasional text-page backup series, “From The Shade’s Journal.” Usually this would be something about the Shade having lunch in Los Angeles with Mickey Rooney or some such, and he’d make fun of Mickey before skipping out on the check. (He was a villain, after all.) I don’t know; I never really read “FTSJ,” because 1) I wasn’t that into the Shade and 2) it’s text, man, and I read the funnybooks so I can look at the pictures. Also, the “Journal” pieces came out irregularly, and I could never remember what the story was from one installment to the next. In other words, I don’t think I missed a lot, but I’d hate to get rid of everything and find out later what I did miss. There were some rumors a few years ago about the Shade miniseries being collected along with the “Shade’s Journal” pieces, and I would get that if it ever came out. Along the same lines, selling off the single issues of Sandman to finance the purchase of trade paperbacks would mean losing the Sandman letters pages. Not that I remember a particularly steamy letter from Tori Amos or anything; but there was one letter, shortly before the Vertigo changeover, which still brings back fond memories. It basically made cruel sport of those who would write in claiming never to have read a comic book before, “but then, after a transcendent evening of physical pleasure, my lovah reached under his bedside table and handed me a copy of issue #29….” The guy then went on to say “we all know you have copies of every JLA/JSA crossover in your closet, so get over yourselves,” etc., and I’m really not doing it justice. Either that or I have much fonder memories than it deserves. Maybe I’ll keep that one issue. Still, the nonlinear timelines of both books brings up another question: in what order should the stories now be read? Isn’t the Ramadan story in Sandman #50 now collected with the “Convergences” stories from about a year before; and aren’t a lot of Starman‘s “Times Past” stories similarly lumped together, when before they were sprinkled in-between arcs? If the collections reflect the authors’ true intentions, that’s one thing, but I’d rather know the order in which they first appeared, because by and large that’s how I first read them. So there you go. I do think it will be easier for me to convert JSA and Teen Titans to trade paperbacks, thanks to the demise of the letters pages…. P.S. I know this makes five entries in five days, but it’s just a happy accident so far. As much as I like doing this, I sure didn’t make a New Year’s resolution to become an everyday blogger. It hasn’t been easy to sort through my feelings about the mega-story which has been running through the DC superhero books since the summer of 2004. I did feel baited-and-switched at the end of Identity Crisis, since I had supposed it to be a self-contained story, not the spark of a longer fuse. What’s more, this is a 2005-in-review essay, and the actual Infinite Crisis miniseries still isn’t at its halfway point. Therefore, by way of concluding my look back at last year, let’s focus on the five summer miniseries which set up the event, and the series affected most by it. Greg Rucka’s two ongoing series, The Adventures of Superman and Wonder Woman, started the year with their own storylines, but soon became wholly-owned subsidiaries of Infinite Crisis. I thought WW was the better series, because I was never quite sure Rucka really had the same kind of handle on Superman. Not that Rucka didn’t have his moments on Adventures, most notably the last Mr. Mxyzptlk story; but for a while his Wonder Woman was really firing on all cylinders, on par with the best of his superhero work. That makes WW‘s surrender to Infinite Crisis and its machinations all the more puzzling. Judging by the most recent installments, Diana will close out her first 19-year post-Crisis series having failed utterly at her mission to enlighten Patriarch’s World through Amazon philosophy. Regardless of whether this will usher in a new era of fantastic Amazonian adventure in 2006, it’s still a depressing way to end a tenure, and a series, which made the most out of the character’s potential. Another post-Crisis book being ushered out by Infinite Crisis is Superman, although it’s the 19-year-old book, not the 66-year-old one now set to regain its original title. After finishing up Brian Azzarello and Jim Lee’s inconsistent “For Tomorrow,” Mark Verheiden and Ed Benes took over in order to tell a series of stories about people becoming paranoid of Superman. While not a direct tie-in to Infinite Crisis at first, its connection grew stronger until it too was subsumed into the larger story. Thus, two out of the three (or four, counting Superman/Batman) Superman titles spent most of 2005 complementing Infinite Crisis, which made for an unrelentingliy dark take on the character. JLA was the last of the regular series I read which tied into Infinite Crisis, and it was the most consistently entertaining. The year started with the unrelated Kurt Busiek/Ron Garney “Syndicate Rules,” which recalled Busiek’s glory days on Avengers and contained a few clever mirror-Earth moments to boot. However, even the knowledge that Infinite Crisis elements were upcoming was enough to taint what might otherwise have been meant as moments of genuine character interaction and/or drama. Now those moments were “oh no, they’re starting to fight and The League Will Never Be The Same!” Surprisingly, though, when “Crisis of Conscience” began, it turned out to be a good Justice League story for the most part, even if it did end with some awkward setup for Infinite Crisis and the book’s final arc. Now, the current “World Without A Justice League” is just marking time until the end. It consists of unremarkable arguments, strung together by a slow-moving Key plot, and it is probably interesting only to longtime fans who at last get to see Satellite-era Leaguers interacting on a case again. DC Special: The Return Of Donna Troy wasn’t billed as an Infinite Crisis lead-in, but her multiple-choice history made her a good choice to realize that the Multiverse wasn’t quite forgotten. Beyond that, it was an adequate New Titans story which made more sense if one had just read Wolfman and Perez’s “Who Is Wonder Girl?” from The New Titans #s 50-54. I read those issues in 1988-89 when they first came out, but I was glad of the paperback reprinting them this summer. Now for the main events. I have written already about the bulk of The OMAC Project, Villains United, The Rann-Thanagar War, and Day of Vengeance. (I also did a “2/3 mark” essay back in October.) Villains United turned out to be the best of the four, followed by OMAC, Rann-Thanagar, and DoV. I initially resisted buying Day of Vengeance, and I still think it was the weakest of the three for its treatment of the Spectre. True, the Spectre has been set up for the past several years as an instrumentality of God, which necessarily makes him a tough character to make interesting, but “horny” is still a very hard choice to justify. Thankfully, Infinite Crisis itself has been pretty good. The lead-in miniseries do seem to have helped streamline InfC‘s plot, leaving room for Geoff Johns and Phil Jiminez to craft their tale as a standalone story. I haven’t read the three issues on their own, but so far I don’t think anything major has happened outside their pages. Jiminez especially seems to be enjoying himself, filling the series with allusions to classic DC stories and the original Crisis on Infinite Earths. It is the nature of current serialized superhero comics that creators don’t think fans will accept wholesale changes without being taken along for the process step-by-step. Another version of this was on display in Supreme Power, and the deliberate speed at which that series crept along really turned me off. However, the Infinite Crisis machine set up a number of minor events which could be checked off the list as each little story arc played out. Therefore, instead of devoting X number of issues to accomplish one huge goal, DC let readers choose the little goals they wanted to follow, and the strategy seems to have worked so far. Still, I don’t know if I will want to revisit the “checklist” for a while after it’s all over. There’s an old saying that “you might like sausage, but you don’t want to see how it was made.” As far as Infinite Crisis is concerned, 2005 may be remembered as the year in which the sausage-making was put on full display. I’m now ready for the sausage of 2006.